I told her to make it with what she had who cares if it was designed one way and she made it another. I think it came out great her art teacher at school wants her to put it in the art show at the end of the year she was excited about that. 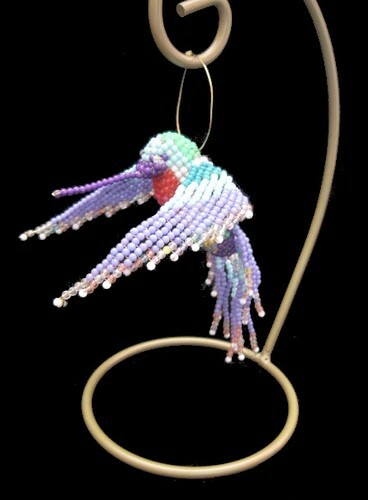 The wings are wired so the bird can hang in different positions which is sort of neat in my opinion was supposed to be a small necklace made out of seed beads according to the pattern but as you can see it is hanging on an ornament hanger so it is much much larger than a necklace. second photo is washed out first it truer to the colors of this. how pretty! 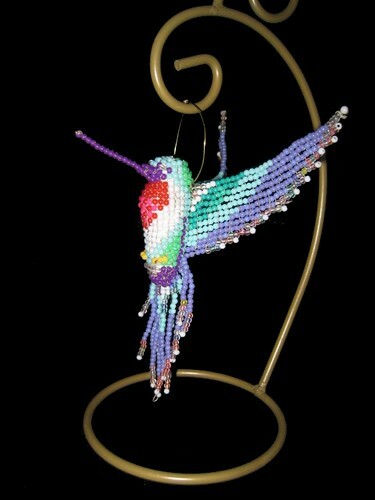 your daughter did a wonderful job on this beautiful hummingbird! I wish I could find the directions to make it! my mother would love to have this to hang in her window! Tell your daughter she did a beautiful job! Very nice!